It has been a long time since I posted anything using the beautiful parchment paper we carry. When creating using this paper one achieves such a soft, elegant look. So for the April Stamp of the Month packet I thought I would share this art form with you in a very elementary way to expose more of you to the beauty that can be created using these simple tools. 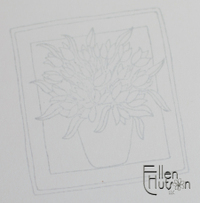 To begin I stamped my Tulips image using Palette, New Canvas on Parchment paper. I then gently heat set it being I am an impatient stamper and don't like waiting for ink to dry - LOL! Be careful to hold your heat source away from the paper though so that you don't "curl" it. 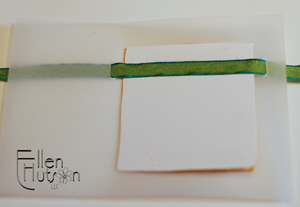 Place your parchment paper stamped side down on a dark padded surface. I prefer to use one of the Pergamano Embossing pads, but beginners can use a black piece of cardstock atop a stack of papers. Next I used my Fine Stylus Embossing Tool to trace all the details of the image. As you can see the Fine Stylus, shown on the bottom, has a much finer tip than any other stylus I carry. I really like this stylus for detailed work. 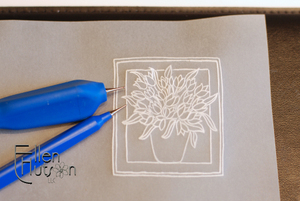 You can achieve an embossed look with other embossing stylus, but it will not be as precise. Copic markers work fabulously on parchment paper! 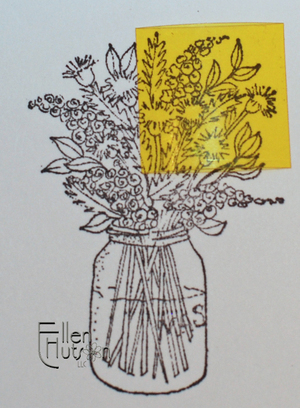 To color this image work on the back side (or opposite side) of the stamped image - the same side as you embossed on. Begin with the lightest colors - B23, YG00, and Y21 (special). Add depth and dimension with B29, YG63, G85, Y21, YR14 and E39. Below is a close-up of the finished image. One of the little quandries that one runs in to with vellum and parchment is that all detail shows from behind. In this case I really wanted the image to pop. 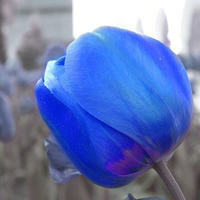 As a solution I then stamped the Tulips image once again - this time I used a very light blue ink pad, Adirondack 's Cloudy Blue - to stamp my image on white cardstock. To hide the adhesive can be tricky. There are many new adhesives on the market - one is made by Tombow and I tried it at CHA, unfortunately I could still see it through the vellum and so I try to be clever in attaching my projects so that no adhesive will show. 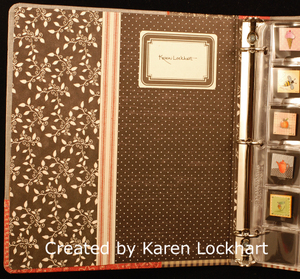 I punched holes in the parchment using my Making Memories Slot Punching Tool. I love that I can punch a slot in any location with this tool. I did learn though that one should use the Making Memories cutting board that comes with it rather than the Basic Grey Magnetic Precision Mat - I managed to punch my slot right through to the metal surface - oops! Fortunately I was able to reinsert the little piece and my mat looks as good as new, but I thought I would forewarn you so that hopefully you don't make the same mistake. Then thread your ribbon through the slots and apply adhesive to the back side of your cardstock placing it directly behind your pergamano piece. 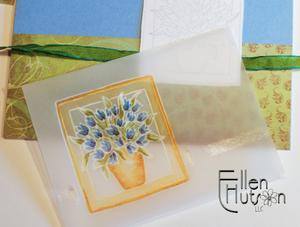 Place your project into position and adhere the cardstock to your cardfront. As you can see I removed the parchment from the ribbon so that I could adjust the ribbon to be in the correct spot for tying my knot. Next apply adhesive to the back side of the parchment piece directly beneath where you will run the ribbon. At this point I realized that I wanted to "frame" the parchment and so I ran my E39 Medium Broad tip around the edge of the parchment. Thread ribbon through slots and adhere the parchment attaching two brads in the upper left hand corner of the parchment aligning them with the knotted ribbon below. 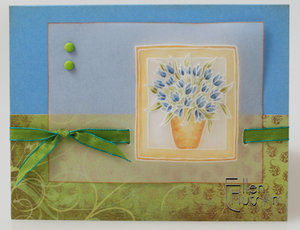 I also sponged a little Vintage Photo distress ink on the Ocean Blue notecard to pull it all together. OK - so I'm a goofball - LOL! I made this post go live and I wasn't even finished with it. 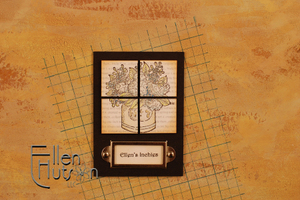 So there you have it - a sneak preview of what is to come later tonight Ü I hope that you enjoy this month's project and jump on board with a Pergamano style or parchment craft project! Guess what - I did it! I did get the new blog, Inchie INKlings, started and have posted the challenge AND my next letter C post there. This will allow you to easily take in the Inchie information if that is your primary interest AND it will give you a "yard" (get it - Inchies/Yard - ha, ha) to see what others will create for the Inchie Challenges. I hope that I can make it a fun little gathering spot for all things Inchie related. I couldn't help myself - I did keep the tag-line - habitat for those who are inchie "challenged". I know - pretty corny - LOL! So go and check it out and let me know what you think. As a paper crafter one of the most fun ways of creating is to take on a challenge. Mish just hosted an Inchie challenge amongst fellow blogging friends - you can see the response to their challenge here. If you haven't had an opportunity to view this challenge yet be ready to have your socks blown off. These girls never cease to amaze me! So here is my first challenge for you!!! Many of you have purchased the Inchie products that we are carrying in our store, so I know you now have the goodies ready to put to good use, so let's have some fun!!! Spring - March 20th, that's tomorrow, (or perhaps today by the time I get this post completed - LOL) is here! I am SO very thrilled to see my Camellia blooming, the plum and cherry trees starting to bud and blossom. Oh it feels so good to have a little sunshine in the area. I would like to invite you to become a part of our very own Inchie INKling Club. Yep, you heard me right - I am starting another blog that I hope to reveal following Easter weekend - Inchie INKlings: Habitat for those who are Inchie Challenged - oops I mean want to be challenged by Inchies - LOL! It will be a place where we will hold a monthly challenge. We will set up an album so that you can see what everyone else is creating. We will be sharing Inchie Sketches (card layout ideas as well as little "templates" for ways to divide up your Inchie - I bet you didn't think that was even a possibility on such a small canvas Ü) and a copy of our Inchies from A-Z will be located on that blog as well. There is more to come, but I can't dish it all right now because I need to get going on the challenge and the remainder of this post! So let's run with our theme, Spring! 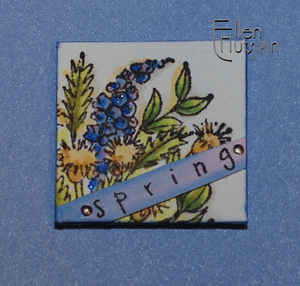 I would like to invite you to join the Inchie INKlings by making an Inchie that shows what about spring appeals to you. It will need to feature a Lockhart Stamp Company image and be entered in to our gallery by April 20th. Details for how this will happen will be located on the new blog, so please stay tuned. I can't propose a challenge without playing myself! So here goes - I'm going to cover as many C's with my challenge creation as possible. 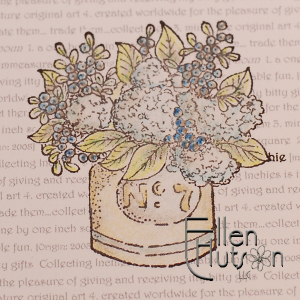 Being that it is the flowers that begin to sparkle and shine I picked a stamp that started with the letter C, Cottage Flowers, and focused on the element of spring I love the most. Using the Inchie Finder included in the Inchie Papers I located the area of the stamp that I wanted to crop. Cropping an image can lead to all sorts of possibilities. Finding the right part of an image for an Inchie is so much easier if you use an Inchie Finder. Using a Retractable Blade Crafe Knife I carefully cut out around the Inchie finder being careful not to cut the Finder. You can also trace around it with a pencil if you are afraid of cutting it with your knife. Begin by coloring your image with your lightest color tones. 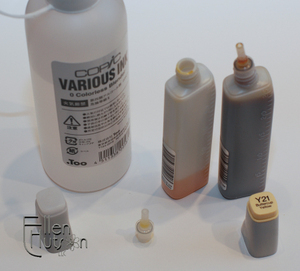 Complete your coloring with a range of Copic colors and a little airburshing. 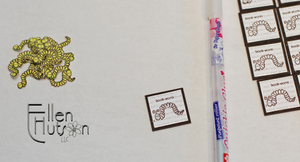 Be sure to add a little sparkle with your Copic Spica Glitter pens or some Ultrafine Glitter. Just a couple of quick tips using the Inchie Pins (or nail head look) as well as the background above. Insert the pins through your cardstock before mounting on the Inchie Square. I use a foam pad beneath so that the pins can go all the way through the cardstock. I then remove the pins and affix my decorated surface to the Inchie. Next I reinsert the pin into the hole and hold the base between my thumb and pointer with my left hand and push the pin through the mat board using a spare Inchie Square to protect my right hand fingers as I push (I am right-handed). Once it has gone through the mat board I complete the other pin and then turn my Inchie over pushing the pins firmly into place. 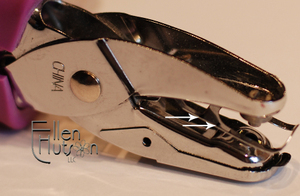 Put on a pair of safety glasses and using wire cutters snip off the excess pin. Copic markers ability to revert back to their original color is truly amazing. To create the color "swoosh" above place the Medium Broad tip of B23 against the Medium Broad tip of V01 - press firmly together. The color will transfer from one marker to the other. The next step is to just color your strips and voila you get these wonderful mixes. Continue to color with your marker and soon you will have your original color back again. 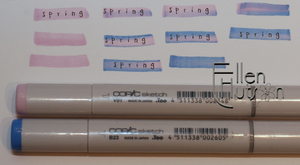 I used my trusty old Snap Stamps to create the word Spring. Oh how I wish someone would come out with a new variety of these flexible stamps! C stands for some other very important Inchie elements, so watch for a continuation of this post soon. So let's get the party started ladies - put your thinking caps on and start your creative process. I hope you will consider entering into our Spring Challenge and join the Inchie INKlings, becoming an Inchie INKlet. Watch for more details soon!!! Product Update: Well ladies I can't believe the response to these pens. Unfortunately we are completely sold out. More are on order, but once again we need to wait our turn. I will let you know when I receive further information regarding our next order, but my understanding is that it will be sometime in April when our next shipment arrives. I'll keep you posted and thank you again for such amazing support! OMGoodness - we just received a VERY unexpected shipment - the Ranger Inkssentials Opaque White Pen that I went so mad for at CHA. I wanted to post as quickly as possible so that you could take advantage of it during today's sale. I truly wish we had known earlier in the day being we have already shipped a bunch of orders, but they are here and up for sale now. Nestabilities have just arrived in Phoenix today! Can you see me doing a happy dance? So what does this mean for timing? It means that unfortunately our waiting game will continue just a little longer, but I want to assure you that these items will be included in our sale on Monday, March 17th as Preorder Items. If you haven't looked at or received our Newsletter Coupon please let us know so that we can forward it to you in time for Monday's sale. Or join our mailing list at the bottom of our homepage and we will try and get a current copy of our newsletter to you before Sunday evening at 6:00pm. It will be essential for you to enter this code to receive the discount. Our Copic supply is also not quite at the levels we would like. We are awaiting the arrival of more sets of CD24D and Copic Gotta Have It All's. Our delivery dates for these items will be the end of March, so with perhaps a little anxiety (OK - so maybe it is more than a little being I truly like to ship your orders immediately) I will go ahead and put them up as Preorder items as well so that you can use your coupon. Copic markers on the White Inchie Squares are BEAUTIFUL! There are so many ways to create intricate backgrounds, but for that post you are going to have to wait all the way until W. Can you make any guesses as to what the letter W stands for? So for today we are going to look at the Basic Copic Background. Creating backgrounds for basic designs is simple. 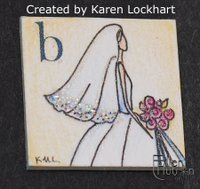 By basic design I am referring to an Inchie I create when I stamp directly on an Inchie Square. There are not a lot of layers to this type of design. Begin by placing your stamp, rubber face up, on your work surface. Ink the surface of your stamp image determining where it is that you would like to position your Inchie on the image. Being that this stamp had recesses in the rubber on either side of the Inchie I was able to easily set my square atop the stamp. If I didn't have this recessed area I would have used my little "pull tab" for the back of my Inchie Square. This pull tab is created using Blue Painters Tape. This tape is ideal for this application being it will not mar your surface when you remove it from your project. 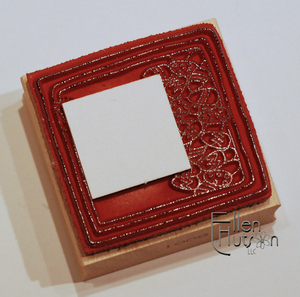 After inking your Inchie Square using Adirondack ink it is essential to heat set your square. I have found that the porosity of the Inchie Squares does not allow the ink to sink in to the surface as readily as the Neenah paper and therefore if you go straight to coloring on a stamped surface you will more likely than not cause the ink to bleed. As I colored the background of the image I began with my new Y21. (See this post for information as to how to make your own custom colors.) To create the sunshiney window effect I did pick up my darker Y21 from my palette and added it around the edges. So what can you do with all those bits of paper that you have left over from a large project? Well turn them into 1"x1" squares of course! Or if you are not fortunate to have saved all your scraps then we do have a packet of Inchie Papers available for you to purchase. 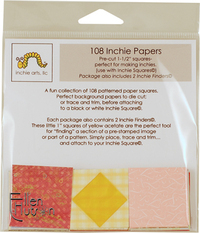 This fun collection of 108 patterned paper 1-1/2" squares will keep you supplied for quite some time. 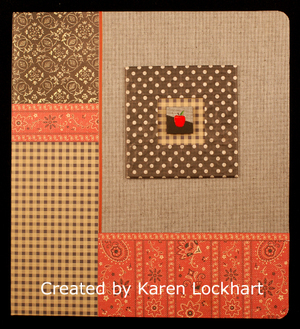 You can die cut or trace and trim before attaching them to your Inchie Squares. Each of these packages also contains two (2) Inchie Finders. These little 1" squares of yellow acetate are the perfect tool for "finding" a section of a prestamped image or part of a pattern. Simply place, trace and trim. The yellow color will hopefully help you spot it easier amongst the mish mash that occurs on most of our tabletops when we get in a creative swing. Karen always has the best organizational tips! 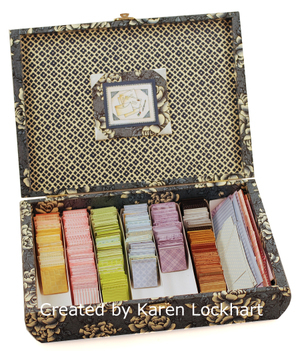 I absolutely adore this beautiful box she has put together to keep her Inchie backgrounds prepped and ready to use. When sorted by color it makes it easy to find the perfect background for your art. Prepare some of these backgrounds for your projects in advance if you are not feeling "it". You know those times when you would like to relax and create, but you just don't have a long-term vision for what it is that you would like to create. 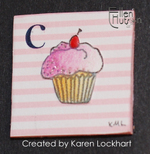 Then start at a later time to create the elements or embellishments to complete your Inchies. I will be sharing more of the backdrop for this little assortment at a later date. For now I just want you to focus in on the assortment of papers that Karen used on these little creations and how she added the focal points to each Inchie. I have to admit I am a bit envious of her beautiful handwriting Ü I would hate to think about how many beautiful Inchies I would ruin if I were to write in cursive on them - LOL! So if you are like me perhaps you might consider printing and cutting out words or stamping them and adhering them to the finished creation instead. These are just a few of the ideas that I could come up with today/tonight. I hope that they inspire you to try a myriad of different background techniques when creating your Inchies! In the Bunny Girl Inchie post above the background is created by using a special VERY light yellow marker that I created. I have not found a yellow in the Copic line that I have fallen in love with. Most are too high chrome and my desire for a more buttery yellow led me on today's mission to create a yellow I love. Begin by removing the Medium Broad tip from your empty Sketch marker. I just use my bare fingers to pull out the tip. Being the marker is empty the tip is dry at this point. Once the tip is wet you can still pull it out with your fingers, but they will become inky, so if you prefer clean hands you can use the Copic Tweezers or other Tweezers you don't mind getting ink on to remove the tip. To mix my special color I used an Empty Various Ink Refill container and filled it up to the 5cc mark with Colorless Blending Solution. I then added Y21 Ink Refill drop by drop until the color appealed to me in the bottle. I was going to count the drops, but part way through I got so excited I forgot what my count was - LOL! Perhaps next time I will get my personal assistant (my 8 yr-old Ü) to help me count - she would remember! When I achieved "that" color I would then drip the color on to a sheet of white cardstock to determine if it was dark enough. I continued to add Y21 drop by drop until I arrived at the color I was looking for. Above shows one drop of ink with the new color on the left and Y21 on the right. To fill the empty sketch marker, place the tip of the refill container directly into the marker opening. Don't try taking a picture at the same time as you fill your container though. If you do, you too can spill ink over the sides of the marker - LOL! I then removed both caps from the marker and laid it flat on my work surface and watched the color wick to the tips of the marker. I then replaced my caps and left it for a couple of minutes. The picture above shows the color difference between Y21 and my new mix. I am very pleased with the end results and it made it so much easier to create the soft blended out background on the Bunny Girl Inchie. I also want to link you to my pal Mona Lisa's amazing discovery - check it out - I am excited!!! Adirondack was the first ink I fell in love with six years ago and I still love it - needless to say I can hardly wait for Lis to share her other discoveries with you!!! I just had to interject an inspirational Easter Egg post in the midst of Inchie Mania Ü One of the first things Marianne, of Copic Marker, told me about last year was how fun the airbrush system is with Easter Eggs. Since that time I have been anticipating what I can try with this concept. So today I will share a couple of different ideas I played with. 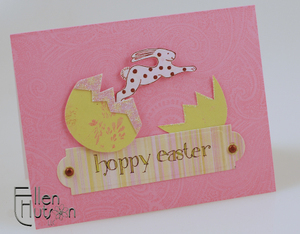 This first egg was created by inking the Dottie Bunny stamp and laying it inked image face up on my work surface. I then VERY carefully rolled my egg across the inked image. Needless to say this is try number three - LOL! - but persistence paid off. I then created a mask out of Eclipse Tape and secured it firmly over the bunny. Using the airbrush system and Sketch Marker colors Y38, BG45 and YG03 I sprayed the egg using the Medium Broad tip. The really cool thing about this is that as I sprayed, the air from the brush gently rolled the egg from one side of my work surface to the other. This allowed me to evenly spray the egg without even having to touch it. I then sprayed each end with it's coordinating color. Finally I removed the mask and used E55 and RV34 to color in Dottie. This next series of eggs I will call my "Masked Eggs". Once again I created a mask out of Eclipse Tape for the bunny stamp. This time I secured it in place and once again sprayed using the same series of colors. The middle back egg was sprayed with the same three colors. I then came back using Y38 and created the flowers with the COPIC Marker Sketch Brush technique I shared with you back in February in this post. 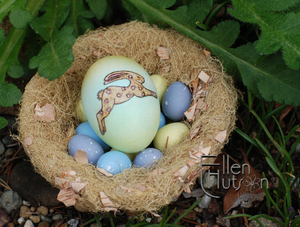 The last egg in this series was created by punching the little flower masks out of Avery Color Coding Labels. Ribbon and bling was added to create this fabulous little trio. Other totally fun embellishments to use would be pearls, flowers, and Dew Drops. Or you could load up one of the mini mister's with some alcohol blending solution and alcohol ink refill or Color Wash, add a little Perfect Pearls to it and give it a Tim Holtz like whirl. Ohhhh - shimmery misty eggs. 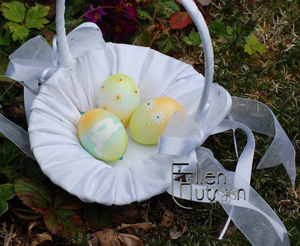 Or load up a paper towel wtih alcohol blending solution and after airbrushing give your egg a very unusual tie dye effect. 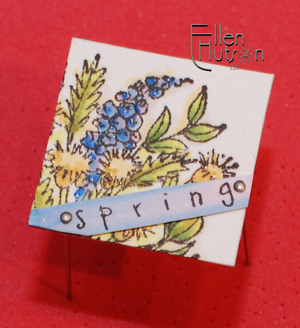 Or put some alcohol ink on a felt applicator and pounce it on your egg, then roll it on a stamp. OH NO - this gives me more ideas and I don't have any more time!!! So help me out ladies - create some wonderful Easter Eggs and link me up to them!!! I want to see what it is that you will be inspired to do with this concept. Created using Bride, Prismacolor color pencils, Spica Clear glitter pen, Sakura Stardust glitter pen, and Ultrafine glitter. 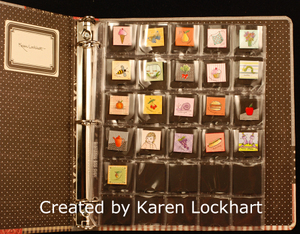 The question became quite apparent as Karen began producing her Inchies - how would she keep track of them? where would she put them? It was at that time that Lisa of Inchie Arts went in search of a solution. I absolutely LOVE the solution she came up with! This binder is such a cool concept! It is made out of recycled corrugated cardboard and is 100% recyclable. The most unique feature of the binder is that the metal spine containing the rings can be removed from the binder allowing you to lay it flat for decorating. Simply remove the screws from the metal rings and detach the rings from the cover, lay flat and personalize. 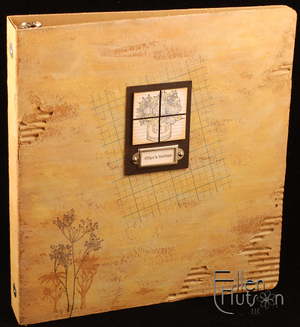 Cover with decorative papers, paints, stamps, embellishments and Inchies of course! Reattach the ring spine once complete and you are ready to go. Being that the cover is completely removable you can also change out your covers after they become worn or if you determine that you would like a new fresh look. Now to inspire you with some binder decorating ideas. Each one of you will have a look that is distinct to you. As I designed my cover I let a creative side of me show that I rarely expose. I love the grungey look and so I decided to bring that side of my creative personality out in this cover. The wonderful thing about corrugated cardboard is the textural quality it has. I began by removing bits and pieces of the cover surface. This was NOT easy - LOL! This cardboard is VERY well made and so it took me a bit to work it off as I did so in a systematic fashion. I then followed up with two different colors of Distress Crackle Paint - Antique Linen and Old Paper. After allowing the paint to dry I then followed up by sanding the surface and then sponging and rubbing Distress Ink - Tea Dye and Old Paper - over the entire surface. To enlarge the area of the focal point I stamped the Grid Paper backgrounder in Beaux Arts Blue. I also wanted to balance out the front surface of the binder and have been patiently biding my time hoarding my wonderful Kim Hughes Silhouette Blooms I for the perfect occasion. 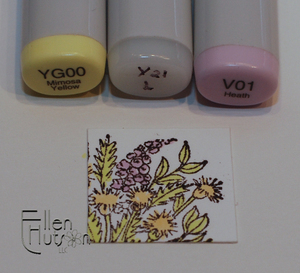 These stamps coordinate beautifully with Tim Holtz Nature's Moment Queen Anne's Lace. The scale of the two together made me giddy - LOL! 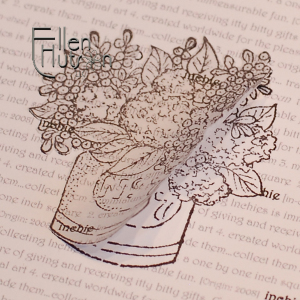 I then set about creating an Inchie "puzzle" using the Lockhart Hydrangea stamp. One might at first wonder how on earth you would incorporate a Lockhart stamp in to a grungey look, but it was SO fun to bring a new look to this otherwise colorful stamp. I began by creating my Inchie definition background using Word. (I still hope that I can figure out how to link up a document here on my blog. If anyone has any suggestions I would truly appreciate knowing how to do it. I have read the Typepad information, but... just not enough time in the day to figure it out without spending a ton of time.) 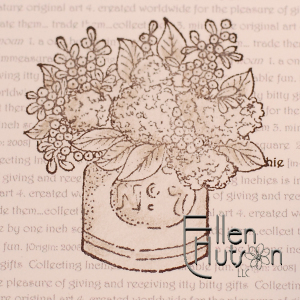 I then stamped my Hydrangea image onto Solar White Cardstock. Next I stamped and created a mask with my Eclipse tape and placed it over my stamped image. I then sent my cardstock through the printer and achieved the results shown below. Karen has recently been describing a wonderful artist technique referred to as grisaille to me. I do believe that she has some upcoming classes that may include this technique. After looking it up on the internet I learned that it is a multi-layering art process. It is begun by applying shades of gray to your work surface. So using the many Warm Gray's and French Gray's in my Prismacolor Colored Pencils I played with this concept. This is then followed by the addition of muted color. I scaled the image to a 2" square and cut it into quarters applying it to Black Inchie Squares. Then these were adhered to a Black Mat Board Base and using a silver tag holder I attached the binder title. I did have to laugh being in the end my grungey look still has a sense of elegance to it - oh well, what's a girl to do? Now I want to share a polar opposite of this binder to spur on your creativity and bring you a completely different look. Karen is the queen of covering!!! Her ability to cover boxes and books and... is extraordinary. I so admire the amazing detail and crisp quality of everything she creates. "Country Kitchen" are the words we are using to describe Karen's binder. It has a warm, cozy feeling to it. The details are incredible. 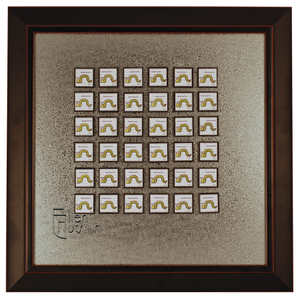 First I want to tell you about the framed square - it is metal! So you know what that means - she can change the Inchie on the front with a whim. Being that Karen is so meticulous she also covered the inside of the binder! Look how beautiful the details are! This view shows the inside of the binder. In this picture you can see how the Inchie Pocket Pages work. In each pocket Karen has inserted a black piece of cardstock to give each Inchie a unified background. After journaling in the Inchie Index regarding each Inchie it is then inserted in to a pocket or put out for display. Much more will be coming on ways to display your Inchies as well as more information regarding this storage system. Well it is apparent to me that Typepad is not on my side today - LOL! I have just been switched over to the Edit HTML method of posting, being my post has become too complex - aargh. I don't know HTML - LOL! So this last part could be rather interesting when it goes live. I'm going to give it my best shot to wrap up now. B has many more entries that could be posted about - backgrounds is one that is essential. I hope to share more regarding the letter B tomorrow. I'd best just make this post go live now. Thanks for hanging in here with me and have fun playing with this whole concept! Yeah - I'm back! I've been BUSY!!! There are some fun surprises in store for those who would like to participate. I'm not certain how many of you have noticed a new link on our store home page but we are putting together a mailing list for our current customers. Scroll all the way to the bottom of the page and you will see the link. Watch for this new form of communication - our newsletter to hit your in box shortly. Our team will be providing you with new tips and techniques to try out. You will also be the first to know of upcoming sales and events, as well as new items that are available in our store. Our goal is to keep our newsletter simple and informative. We will do our utmost not to bombard you with constant updates, so if you are interested and are not a current customer of ours then hurry and sign up now - we have some wonderful things to share with you soon! One of those items you are going to be given a BIG hint at tonight! It has been some time since I have posted information about Inchies - they have not been forgotten. In fact Karen Lockhart and I have been working together with a new business colleague, Lisa Lee of Inchie Arts. We are thrilled to support her new adventure - she has been helping us out with solutions to our Inchie problems. Realizing that 1"x1" matboard squares are difficult to cut perfectly a solution was needed. Lisa has come to our rescue with some wonderful solutions. Wait until you see what she has come up with! I am not going to give away all the details yet so be certain to watch our blog, sign up for our newsletter and watch our store for changes! As with all good things it is important to me that I do my very best to share as much information as possible in regards to new ideas. I want to get your creativity flowing, your enthusiasm for crafting stimulated - I want you to have FUN!!! So here we go. 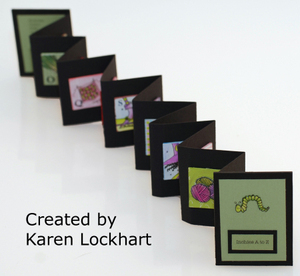 Karen Lockhart has created THE most adorable accordion of Inchies - Inchies from A to Z! 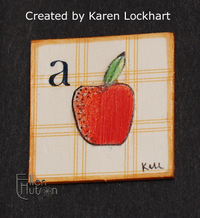 With each post I will cover a new letter of the alphabet sharing from Karen's wonderful Inchie Accordion. I will also be adding my own ideas and inspirations for each letter of the alphabet. Tonight we are going start with A. 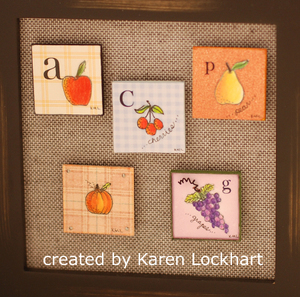 Created using Itty Bitty Apple, decorative paper and Rub-On Alphabet letter. We are also going to talk about the ABC's of Inchies. Whenever I hear about the ABC's of something it makes me think that I am learning the basics - it's back to those five W's. Who started you on the Inchie craze? I'm going to blame it all on Karen Lockhart - LOL! It's ALL her fault Ü She told me about them and then she started creating them. I fell in love with these tactile, adorable little squares she created and now I am creating them too - oh dear - I guess I'm a lemming! It is a miniature work of art that one can give as a gift, use as an embellishment, or trade with fellow crafters. What size is an Inchie? An Inchie should measure 1"x1" square - now technically I guess it will no longer be an Inchie if it goes past that size but do you really think someone is going to be measuring your Inchies - LOL! What material do you use to create an Inchie? I primarily use mat board and chip board as the base for my Inchies. Others create Inchies using fabric or cardstock. Use whatever you can think of! I plan on covering Inchies with Metal, make them out of clay, play with epoxy and glass, enclose them in UTEE, frame them with toothpicks and branches. Just wait until you see some of the beauties that Karen has created already! What style should an Inchie be? Contemporary, whimsical, quirky, quaint, collaged, simple, complex, unconventional - it doesn't really matter. Pick a style, pick a stamp, pick something that speaks to you and build your little piece of artwork around that element. OK - so I created my Inchie - now what? I believe that you have a couple of different alternatives here. First is the collectability of an Inchie. This is what can make them such extraordinary fun! Invite a group of friends to participate and pick a challenge. Begin with something as easy as a color. For example - "let's all make green Inchies this time." Do your very best work so that you can be proud of that little itty bitty piece of artwork that is going out to your friends. When they arrive you will number them and enter that number in a journal (that will be letter J). You can then create a storage system (more to come on this topic as well - this time you only have to wait until B - Ü) to view them and keep them safe, or you can put magnets on the backs and attach them to a frame or a fridge or... (yep you guessed it - more to come on this as well). The other alternative is one that more people can relate to - use them as embellishments, make them into jewelry, put them on a cardfront. As you can see there are no set rules - it is all up to you - what would YOU like to do with your Inchies? Where do I go to get started? Who can help me? Well you can start right here at our blog, as I said we are going to cover Inchies all the way from A-Z. Hmm - do you think that I can come up with 26 different posts? You can also visit our store - soon something will pop up when you click on this Inchie link. I can't tell you when right now being then I would actually have to be ready at that time - LOL! But stay tuned it will be SOON! Lisa Lee of Inchie Arts - be prepared for good things to come. What you see is just the beginning. When will the big reveal happen? I guess you didn't see that little sentence above - I can't tell you this minute because then I would actually have to be ready - ha, ha! All I can say is SOON! Because they are adorable, addictive, tactile little squares that delight and warm your heart. To see a grouping of these displayed together just makes you smile. You will have a hard time keeping little ones and old ones alike from wanting your Inchies, from playing with your Inchies :D I wish you could feel the delight that we feel when we set eyes on the fabulous creations that have been set before us. I hope to share the FUN that Inchies are with you over the next month or two. 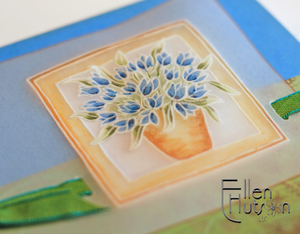 A wonderfully quick way to add color to a white mat board Inchie is by using the airbrush. In creating this special little Baby Bee Karen used the airbrush to quickly create the background for this priceless collection of Inchies. When using a light color tone it is so easy to airbrush the entire piece, stamp and then color without any effect showing through in the final colored piece. Be certain to stay tuned for more information regarding these cuter then bees knees Baby Bees! I am going to share a little project that I have been creating with you. I'm going to "start at the very beginning" and walk you through how it is that I have created these adorable little Worm Inchies. I know it sounds like it should be Inch Worms, but I think in this case they should be called Worm Inchies. Hmmm - I guess I must be getting tired I'm not certain which way it should go - LOL! The first step in creating a group of Inchies is to determine the number you will be creating. I created 36 very special little Inchies. I began by stamping out 37 of these using my Adirondack Pitch Black pad - yep, one extra just in case I made a mistake. As you can see in the coloring progression above I began with the lightest Yellow Green. Being that I knew I was going to cut these out (yes, I am insane - certifiable I do believe) I didn't worry about staying within the lines and so I colored FAST. As I colored I held both markers, the YG00 and the YG03, uncapped in my hand. I would lay down the YG00 immediately followed by a hint of YG03, in the next stroke I would come back and blend the two colors again with the YG00. 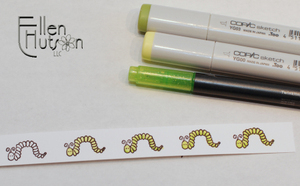 I colored in all the worms and then came back with the Melon glitter pen to add some glam to my cute little worm. Then the cutting began - I was having WAY too much fun! Look at this - LOL! See - it almost looks like an A - ha! ha! Being that I had another project in mind that I wanted to create simultaneously I then created my own background paper. Creating background paper can be a ton of fun. I typically will use Microsoft Word to create my definition documents. Using Dictionary.com I look up the word I want to use. In this case it was bookworm. Maddi, my daughter is such a bookworm and well... I guess I'd best stop with that story before I give away too many details on the next project. Each little square was then outlined with a Krylon Silver Leaf pen and adhered to a 1" x 1" black mat board square. To attach my little pieces I still like to reach for my Quickie Glue Pen. It makes it so easy to keep my adhesive exactly where I want it. 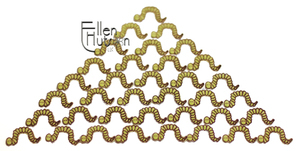 So I attached all my worms and voila - 36 Worm Inchies - or is it Inch Worms - what did you decide? See I even initialed them in the bottom right hand corner. So what do you think I will be doing with these little creatures? Take a few guesses and in the meantime if you haven't purchased from our store before and you want to receive our newsletter, be certain to head over to our home page and enter your information pronto! and the start of something that can be totally ADDICTIVE! OMGoodness - I can not believe it is March!!! AND I can not believe that Easter is in March - March 23rd to be exact! Can you ever remember Easter coming so early??? 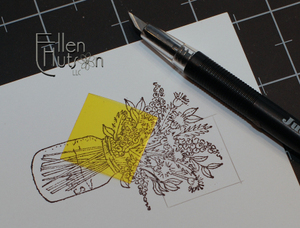 In thinking about what would be appropriate for this month's Stamp of the Month, spring fever hit me. I am SO very ready for sunshine, warmth and pretty colors outside! Being those colors are not yet here I just had to use bright cheery colors in this month's creations. Lockhart's Dottie Bunny has hit a soft spot in my heart. I don't know if it is the folksy, cute factor or the little polka dots - LOL! One of the things that I heard from you is that you enjoyed the simplicity of some of the projects I have created recently. So I took my lead from that and created TWO easy projects for you to replicate using this month's Stamp of the Month packet. The new collection of Memory Box decorative papers, Sprout, has some of the most wonderful images to use as backgrounds with rubber stamps. I love the scale, diversity and color range within each collection! I began with the Dottie Bunny and selected a very simple tone on tone portion of the floral background to stamp the bunny on. I then colored in the circles with my E27, Africano, Copic Marker. 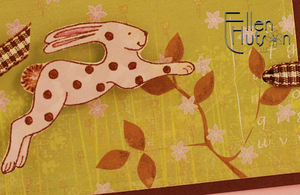 Cutting out the bunny is so very simple and allows you to add depth to your project. Next I selected a patterned paper that would make a wonderful scenic background and selected "just the right" piece of that pattern to cut out my backdrop. I did use my largest rectangle Nestability to cut and emboss this layer, but you can also just cut a rectangle if you do not own the Nestabilities. I would like to share the following tip when you work with background papers. If the color of the image on your background paper is not exactly what you want, then simply adjust the color with Prismacolor color pencils or Copic markers. In this case I used Chocolate Prismacolor color pencil to add a little more of the correct brown tone to the leaves - this really helped aid in bringing the entire card together and added a little more texture to the area I wanted the eye to focus on. Place this decorative paper on top of the Vanilla Bean cardstock and punch your holes. I then added adhesive to the back side of this element, but did not place it in position until I had threaded my ribbon. Once your ribbon is threaded you can then affix this element and tie the knot. To complete this card I added some brads to help bring balance and interest and placed my bunny to jump over the bushes. I will include a copy of this egg, hand-drawn, in this month's packet for those who don't have the punch or who don't feel comfortable drawing a cracked open egg. You will then be able to trace the version that I created. The next adventure I will share is how to create the tag. Being that I didn't have the exact sentiment I wanted, in the exact size I wanted, I decided to create my own. I selected to use a whimsical font call Witchcraft - OK, so I really don't like the name, but I love the font - LOL! The key to getting precise placement is quite simple. First, print out the font on a regular sheet of typing paper. Next cut out your tag and holding it up to a light source affix it to your typing paper precisely over the printed area, centering as need. I typically use a permanent adhesive being that when I pull it off the typing paper it is the typing paper that will tear and not your decorative cardstock, but I have also used temporary adhesive and it seems to have held quite nicely. Then just reprint by sending that typing paper back through your printer a second time. Voila - you will have a precisely printed label. Filling in the letters with some additional color brought the lettering out a little more. I felt that the striped paper had the appearance of grass and so selected it for this label. The holes on the label were just a little too large for the brads so I punched a little 1/4" circle out of coordinating cardstock and affixed it to the label. Then the brad fit nicely to hold the label in place. Last but not least I added some texture to the background using the wonderful CHF Paisley backgrounder inked in a coordinating pink (I believe I used Stampin' Up!s Pretty in Pink or perhaps it was Adirondack Shell Pink - I forgot to write it down and now my memory is failing me - arrgh). Prepped the coordinating stripe, egg top edge and bunny tail with 2-way glue and blinged it with this awesome Iridescent Glitter. 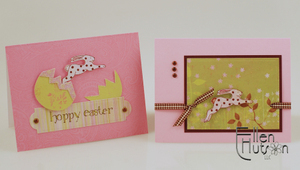 So get hoppin' girls - you don't have much time this year to get those Easter greetings prepared and sent!